India has condemned "racist and bigoted" remarks by a New Zealand TV presenter who made fun of Delhi Chief Minister Sheila Dikshit's surname. TVNZ breakfast show host Paul Henry broke into laughter a number of times as he mispronounced the surname - which sounds closer to "Dixit" in English. He told viewers Ms Dikshit's name was "appropriate because she's Indian". New Zealand's government has apologised for the remarks, describing them as "culturally insensitive and vulgar". 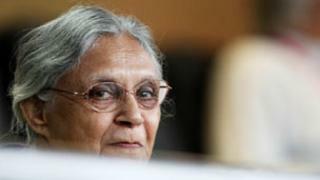 Sheila Dikshit is overseeing arrangements for the Commonwealth Games in Delhi, which have been beset by problems. She brushed off Mr Henry's remarks but said they were "not appropriate". India's foreign ministry summoned the New Zealand high commissioner on Thursday and registered a strong protest against Mr Henry's comments. "It is shocking that such bigoted views have been aired by a representative of a mainstream media organisation of a multi-ethnic democracy like New Zealand," India's foreign ministry said in a statement. "These remarks are totally unacceptable to India and should be condemned by all right-thinking people and nations." High Commissioner Rupert Holborow "regretted the deep hurt caused by the comments of the media commentator", the statement added. Mr Henry's comments were broadcast last week on the state-owned channel TVNZ, but took a few days to be noticed in India. In the footage, Mr Henry mispronounces Ms Dikshit's surname several times - apparently deliberately. He added: "It's so appropriate because she's Indian... I've known about her for a while and I've been laughing ever since." His on-air colleagues pointed out that he was pronouncing the name wrongly on several occasions. On Tuesday, TVNZ suspended Mr Henry for two weeks for questioning whether the country's Indo-Fijian Governor General, Anand Satyanand, was a proper New Zealander. "Is he even a New Zealander?" Mr Henry asked Prime Minister John Key on Monday. The channel said that Mr Henry had "well and truly crossed the line" with his comments on Mr Satyanand. It has not yet commented on his remarks about Ms Dikshit. Mr Henry has a reputation for controversial comments. He once described Scottish singer Susan Boyle as "retarded" and accused a female guest from Greenpeace of having a moustache, New Zealand press reports say.